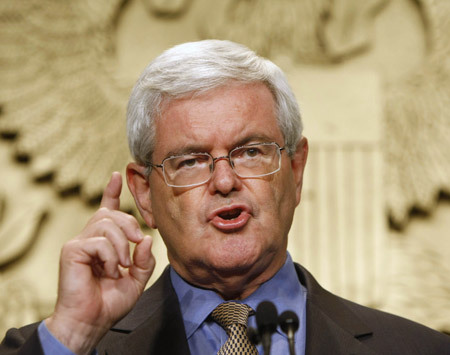 The Rag Blog: Peter Montgomery : Newt Gingrich Wants to Make America More Like Texas! Peter Montgomery : Newt Gingrich Wants to Make America More Like Texas! Newt Gingrich: Texas Number One! In his presidential campaign announcement on Sean Hannity’s Fox News Channel show last week, former House Speaker Newt Gingrich praised job creation in Texas and said he’d been talking to Texas Gov. Rick Perry. "I know how to get the whole country to resemble Texas,” Gingrich told Hannity. That could go down as the worst campaign promise ever. Maybe that should be the motto for Newt Gingrich and his fellow anti-government demagogues. Texas is where the modern conservative theory of budgeting -- the belief that you should never raise taxes under any circumstances, that you can always balance the budget by cutting wasteful spending -- has been implemented most completely. If the theory can’t make it there, it can’t make it anywhere. In fact, Texas lawmakers have been struggling all year to figure out how to deal with a massive budget deficit. An AP story from March, headlined “Texas’ economic miracle beginning to tarnish,” noted that the state’s budget shortfall was “among the worst in the nation.” A temporary budget deal in March involving more than $1 billion in spending cuts still left the state $23 billion short over the next two years by one estimate. Proposed cuts could result in layoffs for 100,000 school employees and 60,000 nursing home workers and eliminate 9,600 state jobs this year. Just this week lawmakers struggled to reach agreement on a deal to close a $4 billion deficit in the current year, which ends in August. It is possible that entire crisis may have been manufactured by Perry and other anti-government Republicans to give lawmakers a justification for further slashing government and basic human services. “I know how to get the whole country to resemble Texas.” Uh, thanks, Newt, but no thanks.